Learn this easy short row pattern, and endless varieties and sizes of round objects can be made: placemats, coasters, even a blanket. The coasters would make a nice hostess gift for holiday parties. Size 6 (US) needles, worsted weight cotton yarn. There’s a new presence on the knitting web, Rosie’s Yarn Cellar, located in Philadelphia. (Website: http://www.rosiesyarncellar.com/) This past month, they’ve posted several cool patterns, and today I came across this cool mittens pattern, knitted from side to side, and shaped using short rows. Designed by Lisa R. Myers, and named “Burt’s Mittens, this looks like it’d be lots of fun to try out. I love all the innovations that have been coming out these last couple of years. Anyway, here’s the link to download the pattern. Just stumbling around random knitting sites this evening, and up popped this gorgeous beret. It can be knitted in all sorts of colorways, and is made in short row sections, then pieced together. 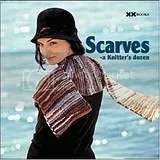 This “Knitter’s Dozen” series is great. The selection of patterns is usually pretty nice, and this particular edition shows some near ways of using some of the new yarns in those gorgeous colorways. 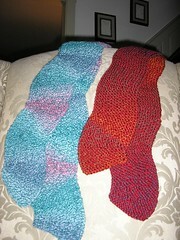 I had a fantastic time knitting these, and plan to make more.